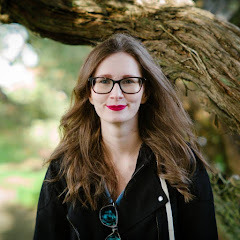 I've recently really gotten into wearing lipstick which is something I wouldn't normally do. While out shopping I've been picking up a lot of the cheaper brands just to try them out and E.L.F is definitely one of the cheapest brands that actually offers some quality. 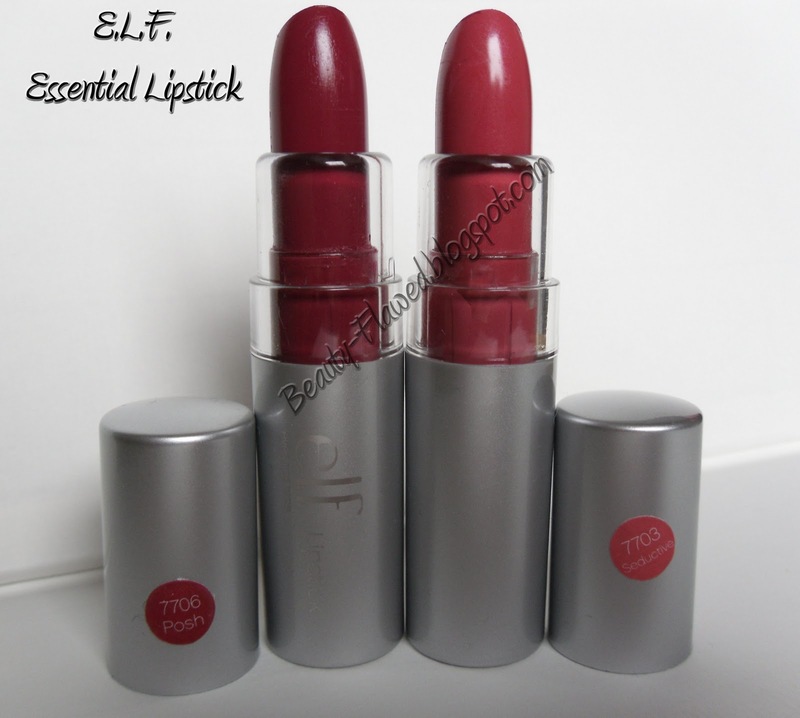 You may remember another blog I did on them a little while ago, E.L.F Essential Lipstick Gypsy and Classy. Seeing as I liked those so much it prompted me to buy more from their line. I picked these both up at Target for $1.00 each they are also available on the Eyes Lips Face Website for a buck as well. Now the swatches on their website I feel are really off and make all of the products look more brown toned, this is not the case however. Posh is a nice vibrant red pink color and Seductive is a little softer pink toned shade. I really like both shades but out of the two I would have to say Posh is my favorite just because of its color payoff. Now I have noticed that even tho these products are highly pigmented they come off big time threw eating and drinking. Not so much that when they come off that they make your lips look cakey tho, these lipstick are highly moisturizing so when it wears off it looks more like you have a light stain on your lips. So not so good staying power but great color and it doesn't dry out your lips. They also apply very smoothly and are not sticky or tacky. Overall I love these little lipsticks, they are great for everyday wear and for the $1 price tag you really cannot beat them! 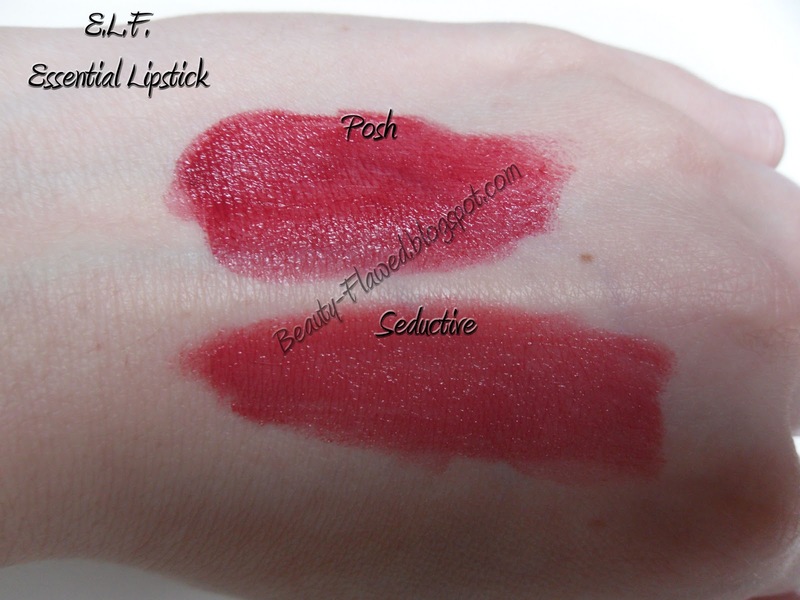 They are great lipsticks and you can beat the price!!! Yeah I agree for sure! Wish they would come out with more neutrals tho, the ones I've seen don't look too good. Amazing, I'm gonna have to pick some up! I don't wear too much lipstick myself, being a guy =P but I could use some variation of the colours in my kit! Thanks for the great review, following! Hey there! Awesome I'm so glad you came over here to check it out! Its definitely worth it especially for artists because well everyone's on a budget in the recession eh! lol I checked out and followed your blog too, you do some awesome nail art! Jealous!